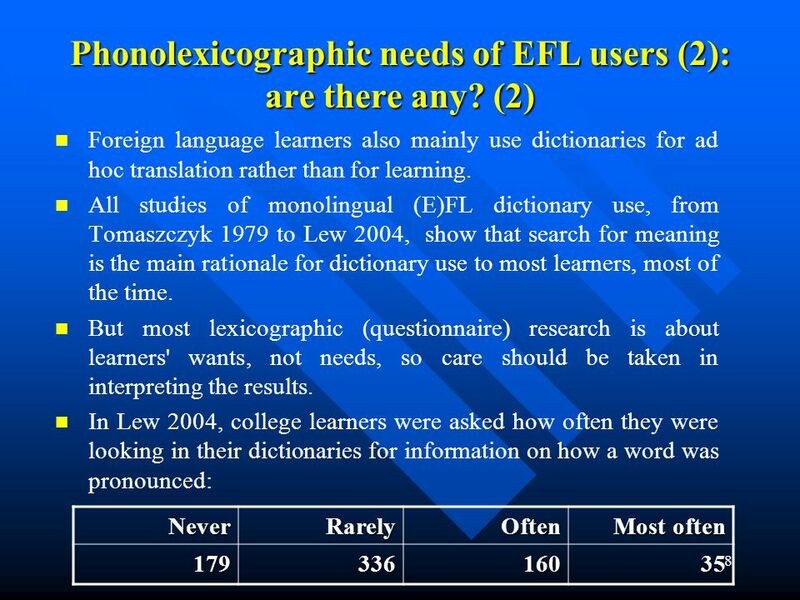 E-dictionaries and phonolexicographic needs of EFL users Włodzimierz Sobkowiak School of English Adam Mickiewicz University Poznań, Poland. 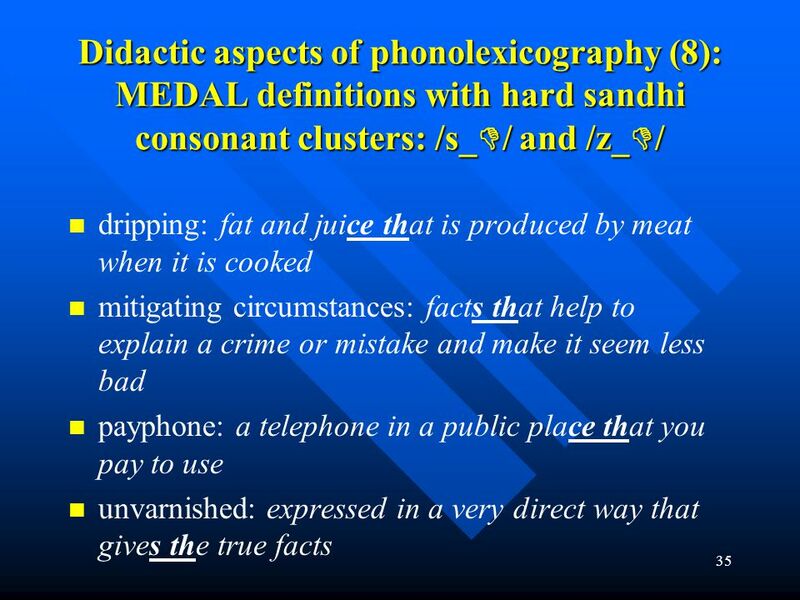 2 Abstract The phonetic aspect of (EFL) dictionaries is among the most seriously underrated and underdeveloped in (meta) lexicography. Pertinent bibliography is scant and even the best learner dictionaries are found wanting on a number of counts. 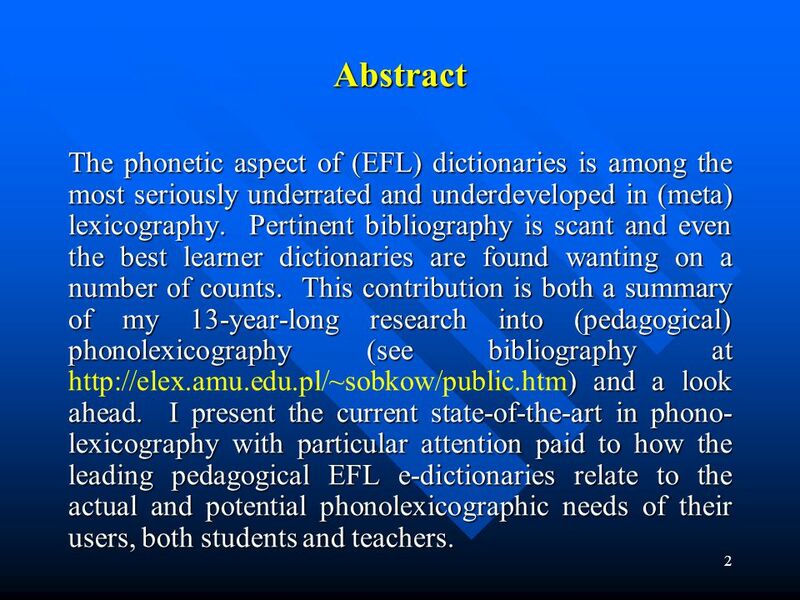 This contribution is both a summary of my 13-year-long research into (pedagogical) phonolexicography (see bibliography at and a look ahead. 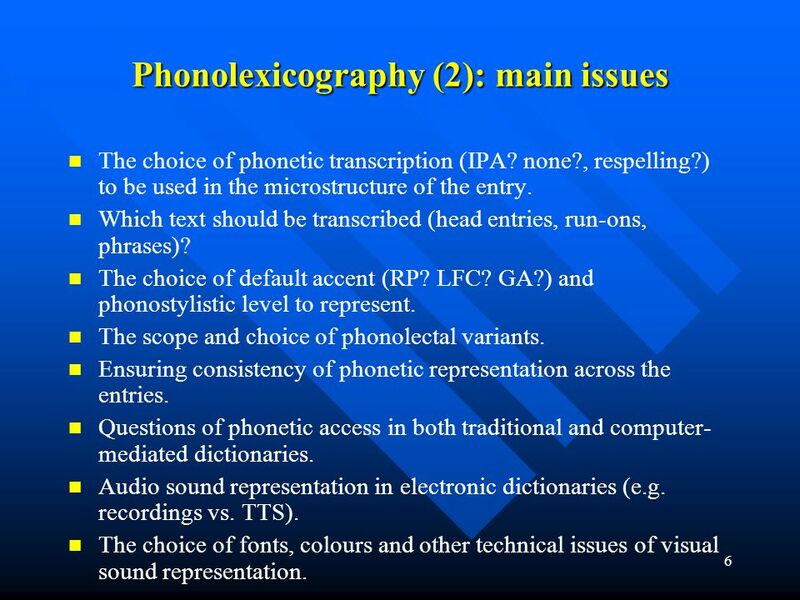 I present the current state-of-the-art in phono-lexicography with particular attention paid to how the leading pedagogical EFL e‑dictionaries relate to the actual and potential phonolexicographic needs of their users, both students and teachers. 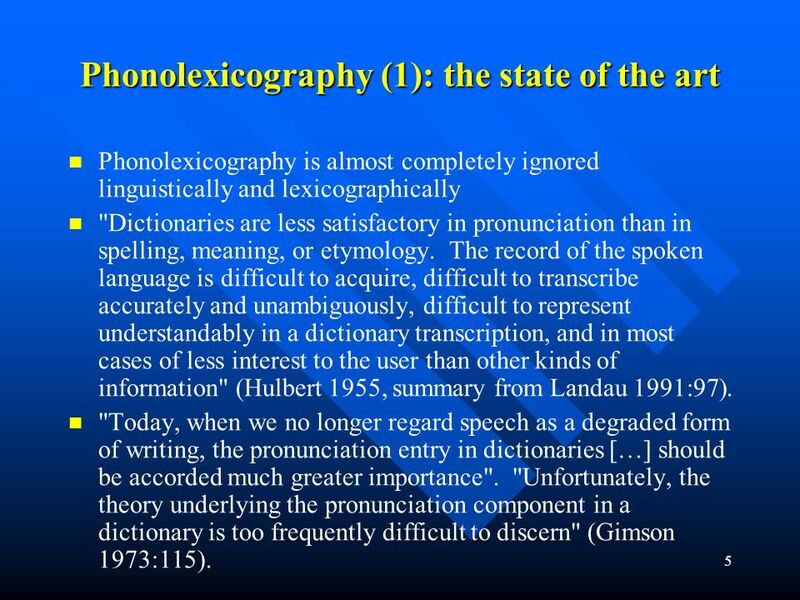 Phonolexicography is almost completely ignored linguistically and lexicographically "Dictionaries are less satisfactory in pronunciation than in spelling, meaning, or etymology. 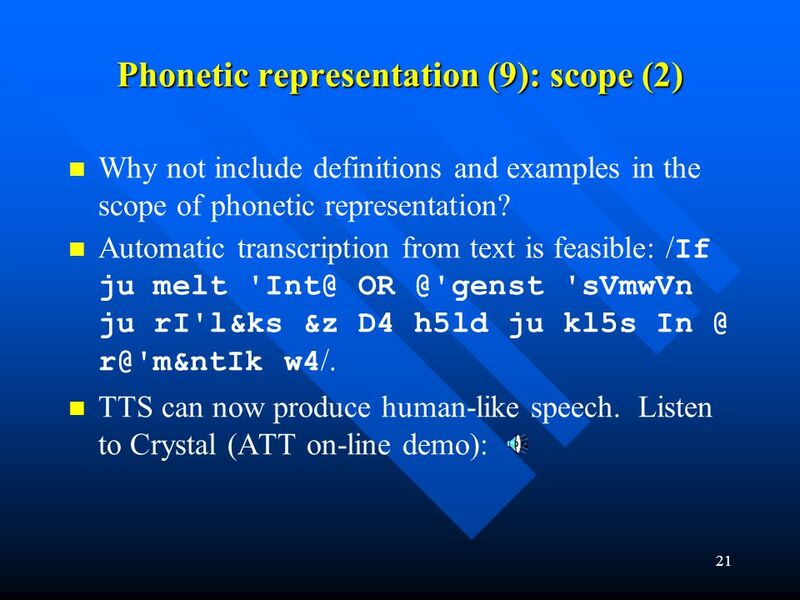 The record of the spoken language is difficult to acquire, difficult to transcribe accurately and unambiguously, difficult to represent understandably in a dictionary transcription, and in most cases of less interest to the user than other kinds of information" (Hulbert 1955, summary from Landau 1991:97). "Today, when we no longer regard speech as a degraded form of writing, the pronunciation entry in dictionaries […] should be accorded much greater importance". "Unfortunately, the theory underlying the pronunciation component in a dictionary is too frequently difficult to discern" (Gimson 1973:115). The choice of phonetic transcription (IPA? none?, respelling?) to be used in the microstructure of the entry. Which text should be transcribed (head entries, run-ons, phrases)? The choice of default accent (RP? LFC? GA?) 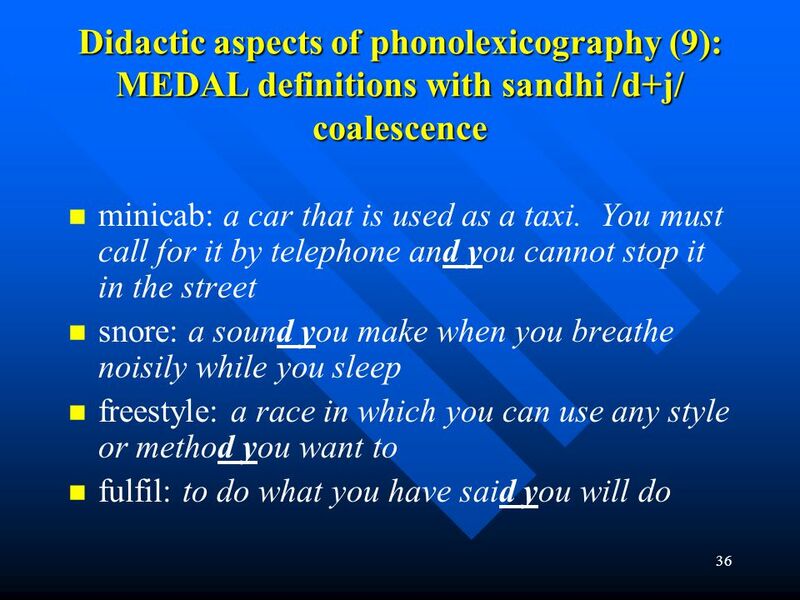 and phonostylistic level to represent. The scope and choice of phonolectal variants. Ensuring consistency of phonetic representation across the entries. 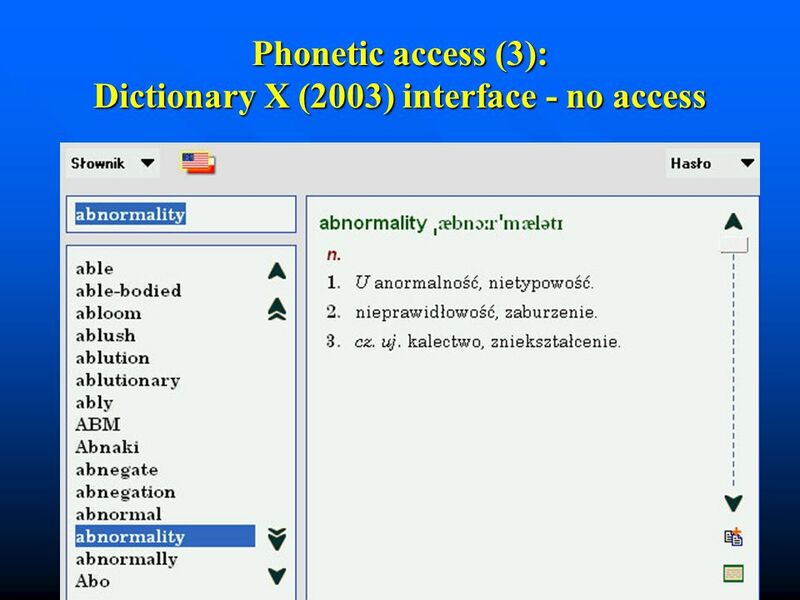 Questions of phonetic access in both traditional and computer-mediated dictionaries. Audio sound representation in electronic dictionaries (e.g. recordings vs. TTS). The choice of fonts, colours and other technical issues of visual sound representation. 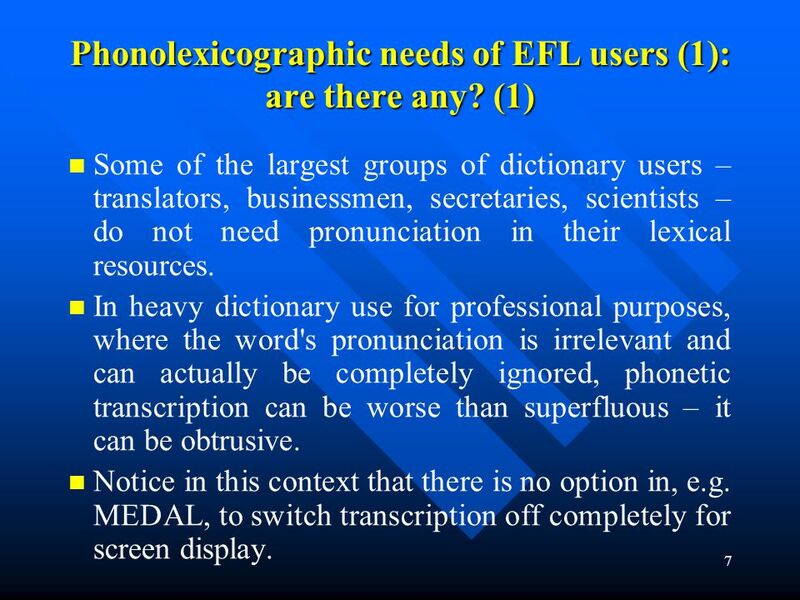 Some of the largest groups of dictionary users – translators, businessmen, secretaries, scientists – do not need pronunciation in their lexical resources. In heavy dictionary use for professional purposes, where the word's pronunciation is irrelevant and can actually be completely ignored, phonetic transcription can be worse than superfluous – it can be obtrusive. Notice in this context that there is no option in, e.g. MEDAL, to switch transcription off completely for screen display. 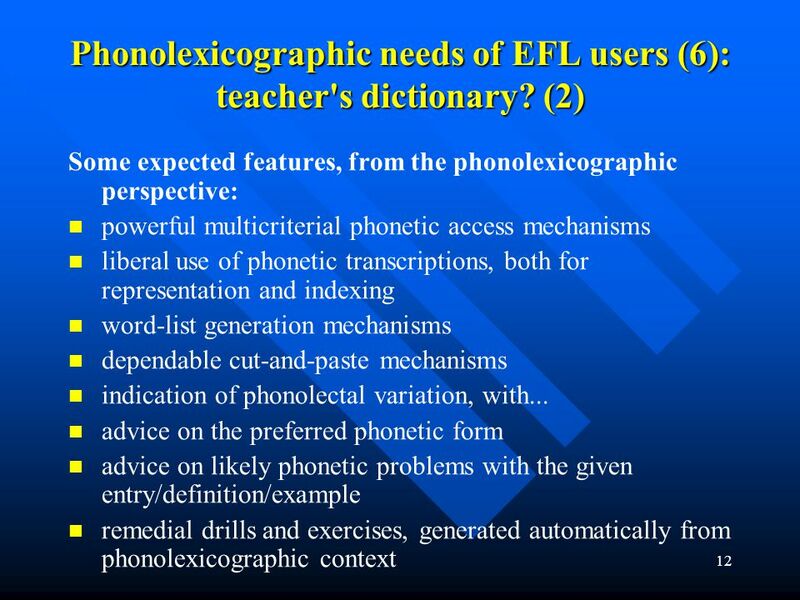 9 Phonolexicographic needs of EFL users (3): what are they? If lexicographers are aiming at global 'user-friendliness' of their definitions (e.g. defining vocabulary), they should certainly also make them phonetically friendly. 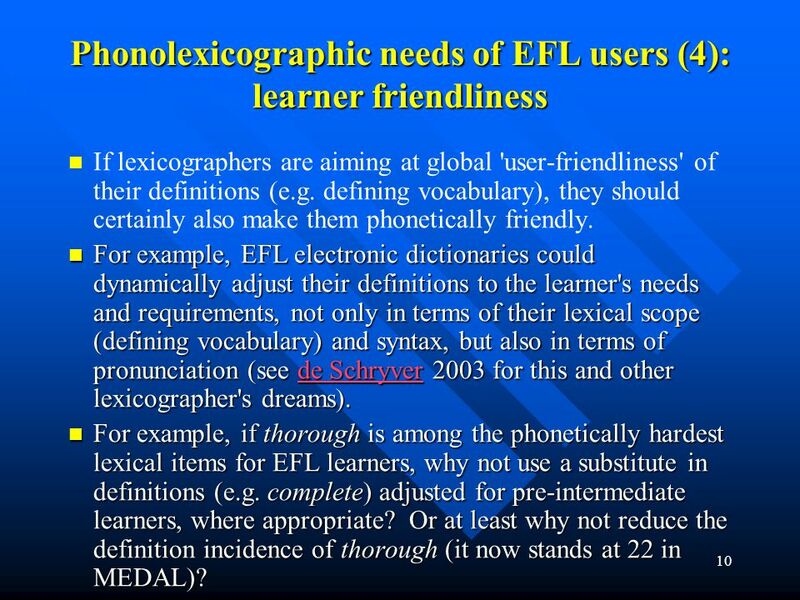 For example, EFL electronic dictionaries could dynamically adjust their definitions to the learner's needs and requirements, not only in terms of their lexical scope (defining vocabulary) and syntax, but also in terms of pronunciation (see de Schryver 2003 for this and other lexicographer's dreams). For example, if thorough is among the phonetically hardest lexical items for EFL learners, why not use a substitute in definitions (e.g. complete) adjusted for pre-intermediate learners, where appropriate? Or at least why not reduce the definition incidence of thorough (it now stands at 22 in MEDAL)? Do teachers use pedagogical e-dictionaries? Should they differ from learners’ dictionaries? 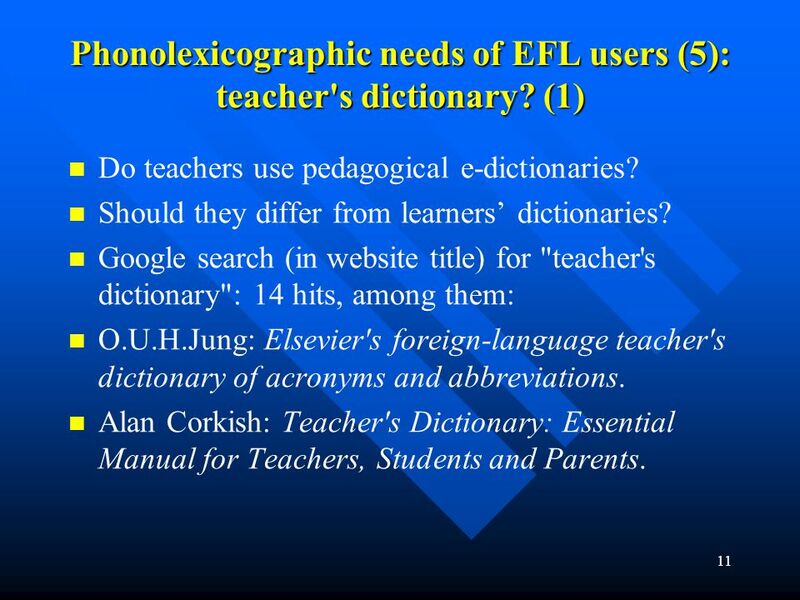 Google search (in website title) for "teacher's dictionary": 14 hits, among them: O.U.H.Jung: Elsevier's foreign-language teacher's dictionary of acronyms and abbreviations. Alan Corkish: Teacher's Dictionary: Essential Manual for Teachers, Students and Parents. 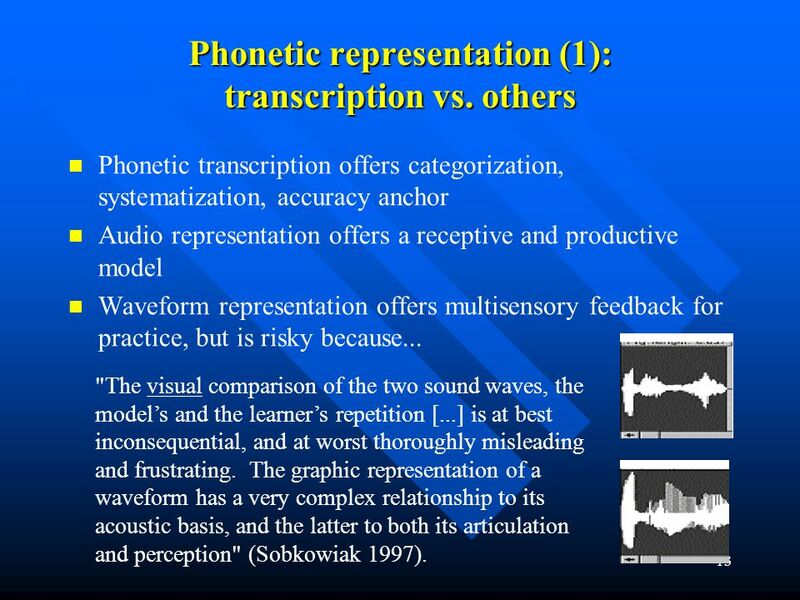 Phonetic transcription offers categorization, systematization, accuracy anchor Audio representation offers a receptive and productive model Waveform representation offers multisensory feedback for practice, but is risky because... "The visual comparison of the two sound waves, the model’s and the learner’s repetition [...] is at best inconsequential, and at worst thoroughly misleading and frustrating. The graphic representation of a waveform has a very complex relationship to its acoustic basis, and the latter to both its articulation and perception" (Sobkowiak 1997). 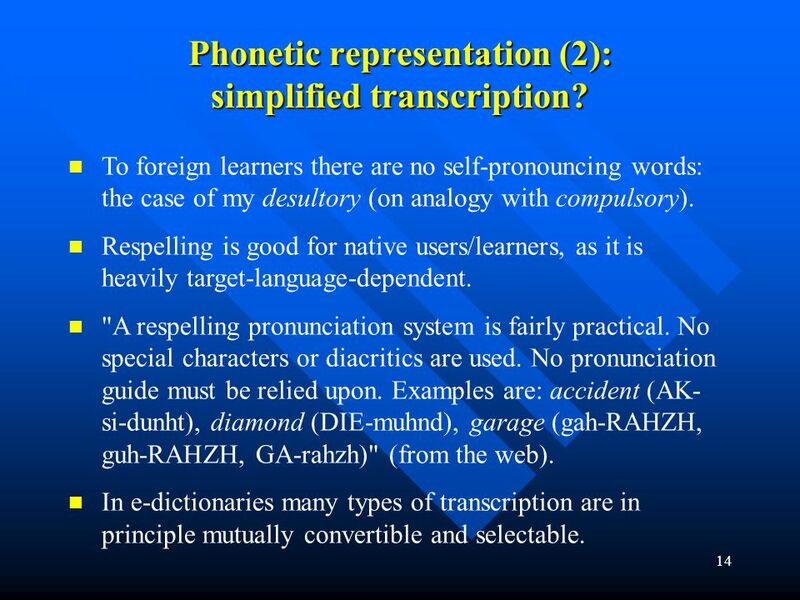 14 Phonetic representation (2): simplified transcription? To foreign learners there are no self-pronouncing words: the case of my desultory (on analogy with compulsory). Respelling is good for native users/learners, as it is heavily target-language-dependent. 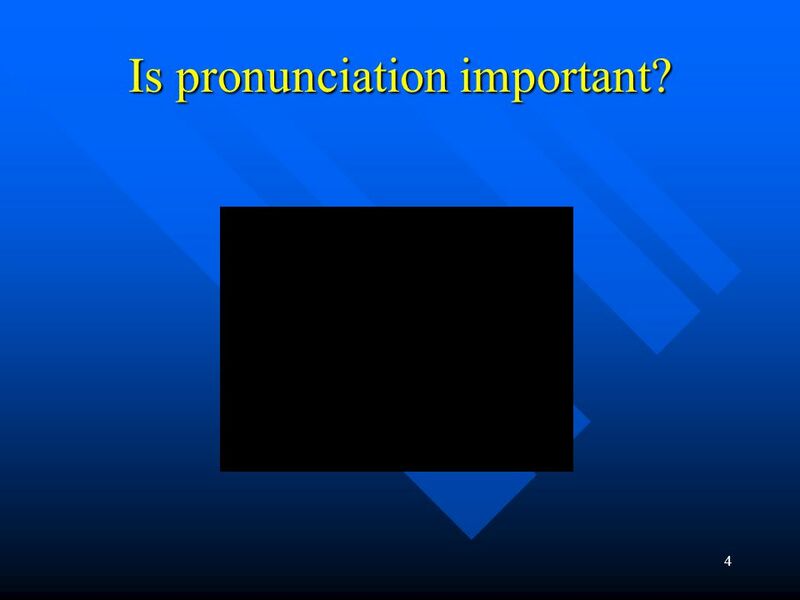 "A respelling pronunciation system is fairly practical. No special characters or diacritics are used. No pronunciation guide must be relied upon. Examples are: accident (AK-si-dunht), diamond (DIE-muhnd), garage (gah-RAHZH, guh-RAHZH, GA-rahzh)" (from the web). In e-dictionaries many types of transcription are in principle mutually convertible and selectable. 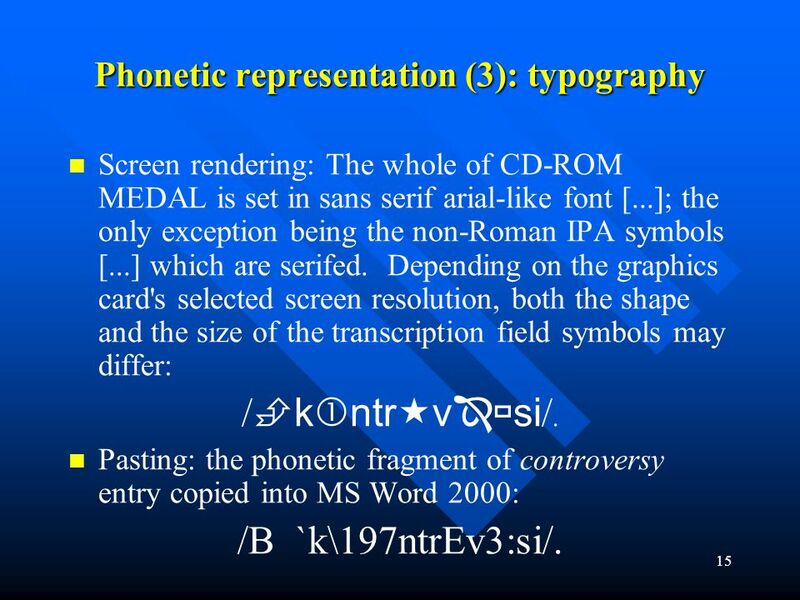 Screen rendering: The whole of CD-ROM MEDAL is set in sans serif arial-like font [...]; the only exception being the non-Roman IPA symbols [...] which are serifed. Depending on the graphics card's selected screen resolution, both the shape and the size of the transcription field symbols may differ: /kntrvsi/. Pasting: the phonetic fragment of controversy entry copied into MS Word 2000: /B `k\197ntrEv3:si/. Which accent? Which phonostylistic variant? Traditional monolectal solutions seem to work best for learners. 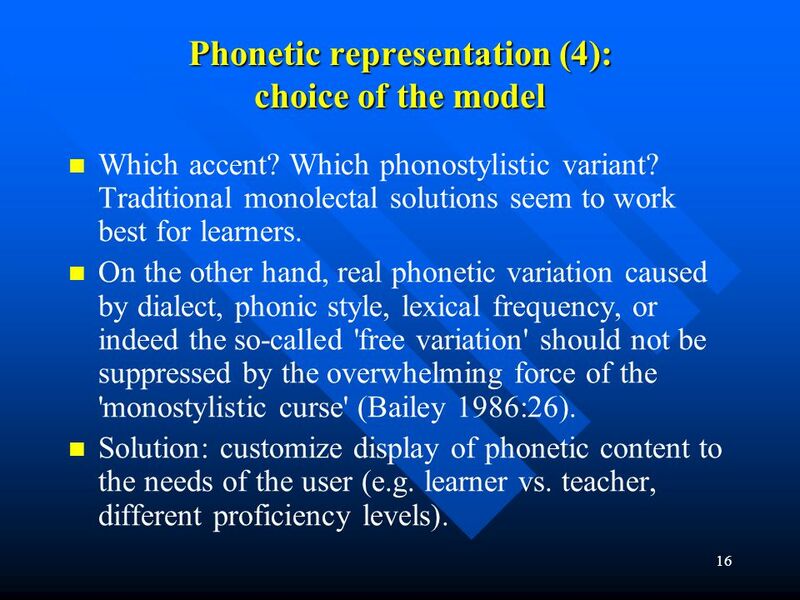 On the other hand, real phonetic variation caused by dialect, phonic style, lexical frequency, or indeed the so-called 'free variation' should not be suppressed by the overwhelming force of the 'monostylistic curse' (Bailey 1986:26). 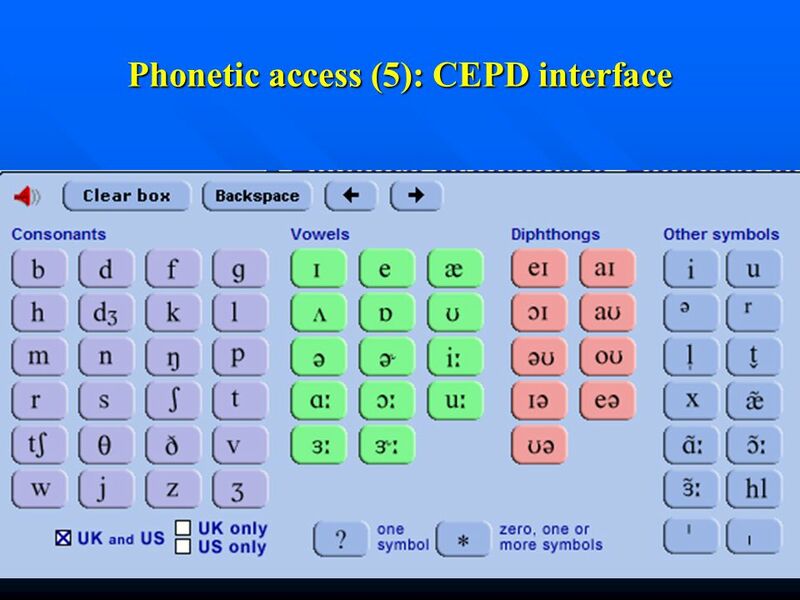 Solution: customize display of phonetic content to the needs of the user (e.g. learner vs. teacher, different proficiency levels). Should phonetic representations in dictionaries be made sensitive to frequency-motivated phonological rules? One example: "Vowels in frequently-used words reduce more often than in relatively rarely-used words" (Fidelholtz 1975:208). 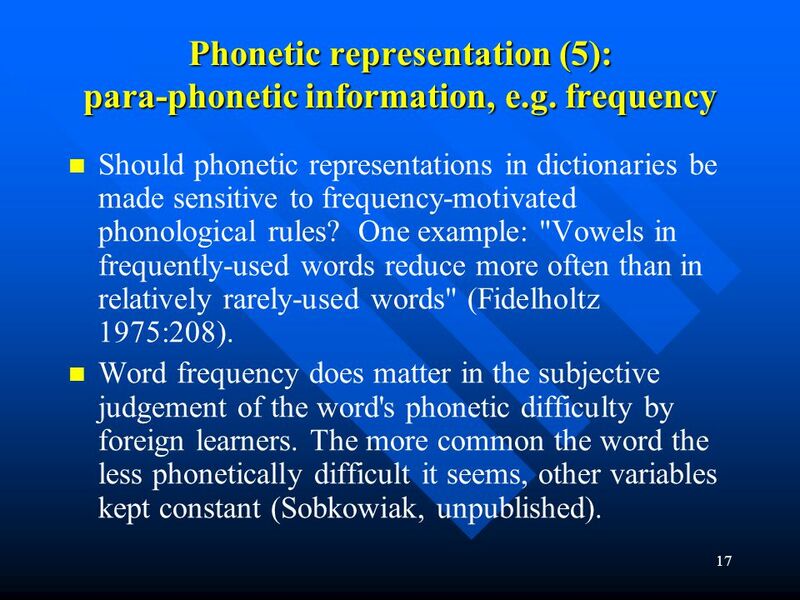 Word frequency does matter in the subjective judgement of the word's phonetic difficulty by foreign learners. 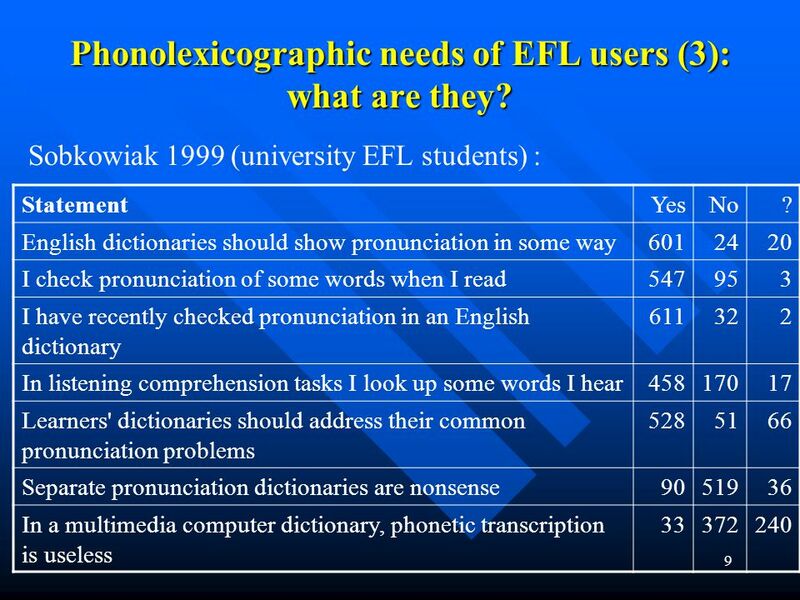 The more common the word the less phonetically difficult it seems, other variables kept constant (Sobkowiak, unpublished). 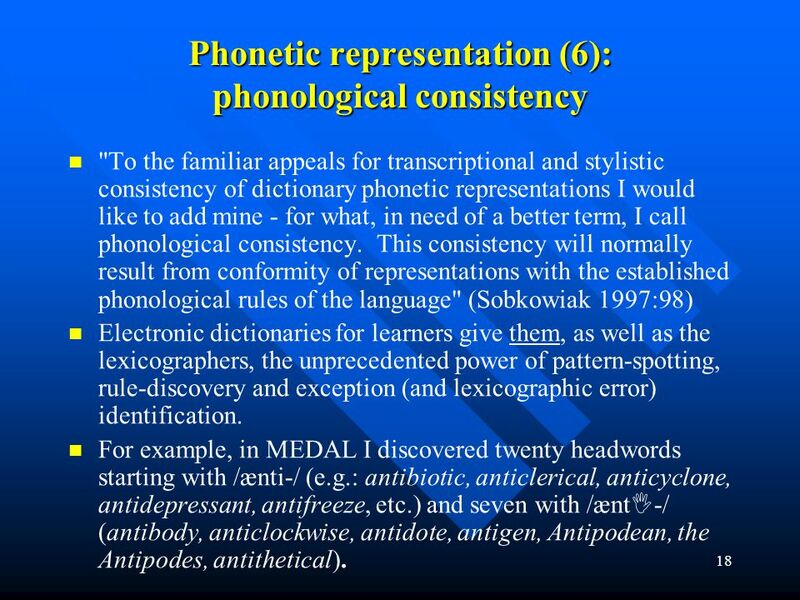 "To the familiar appeals for transcriptional and stylistic consistency of dictionary phonetic representations I would like to add mine - for what, in need of a better term, I call phonological consistency. 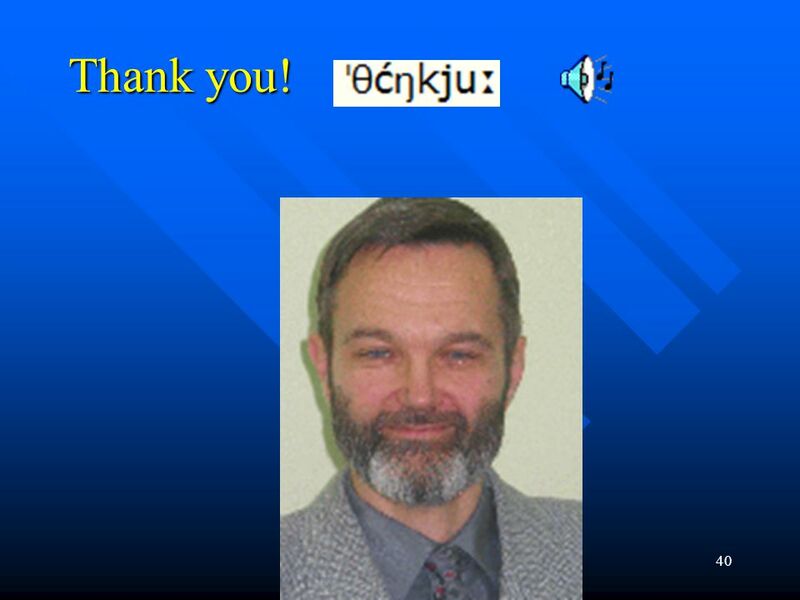 This consistency will normally result from conformity of representations with the established phonological rules of the language" (Sobkowiak 1997:98) Electronic dictionaries for learners give them, as well as the lexicographers, the unprecedented power of pattern-spotting, rule-discovery and exception (and lexicographic error) identification. 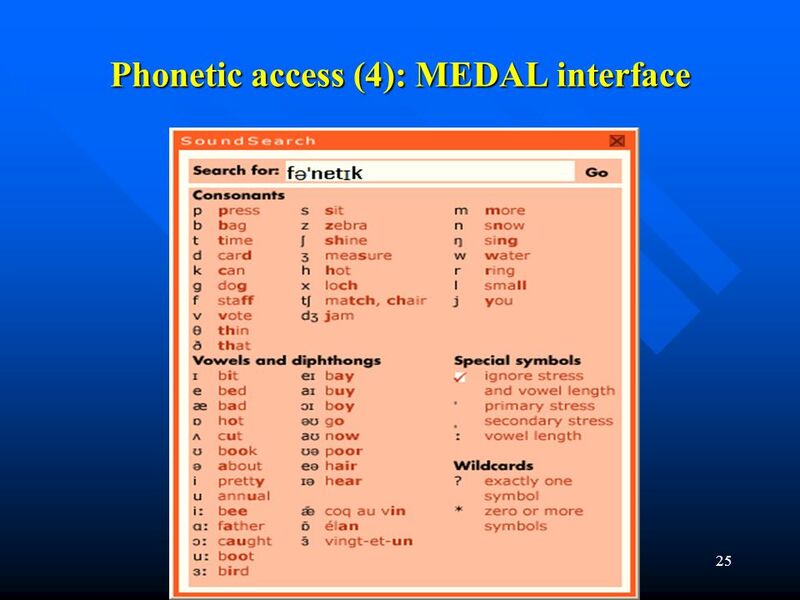 For example, in MEDAL I discovered twenty headwords starting with /ænti-/ (e.g. : antibiotic, anticlerical, anticyclone, antidepressant, antifreeze, etc.) and seven with /ænt-/ (antibody, anticlockwise, antidote, antigen, Antipodean, the Antipodes, antithetical). The main problems with the audio component of many dictionaries are: (a) the list-reading effects (e.g. contrastive stress, sustained intonation contours), and (b) the occasional mismatch between recording and transcription. 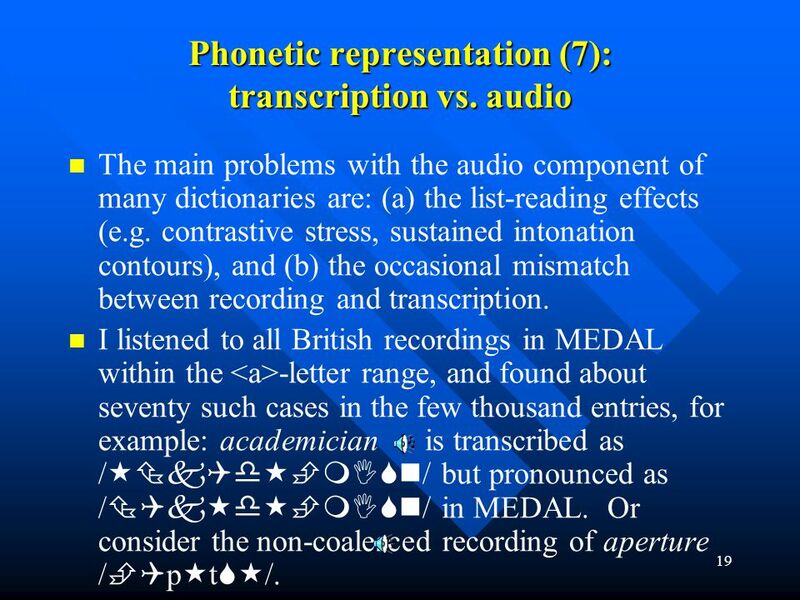 I listened to all British recordings in MEDAL within the <a>-letter range, and found about seventy such cases in the few thousand entries, for example: academician is transcribed as /kdmn/ but pronounced as /kdmn/ in MEDAL. Or consider the non-coalesced recording of aperture /pt/. Can/should phonetic representation extend further than the headword? 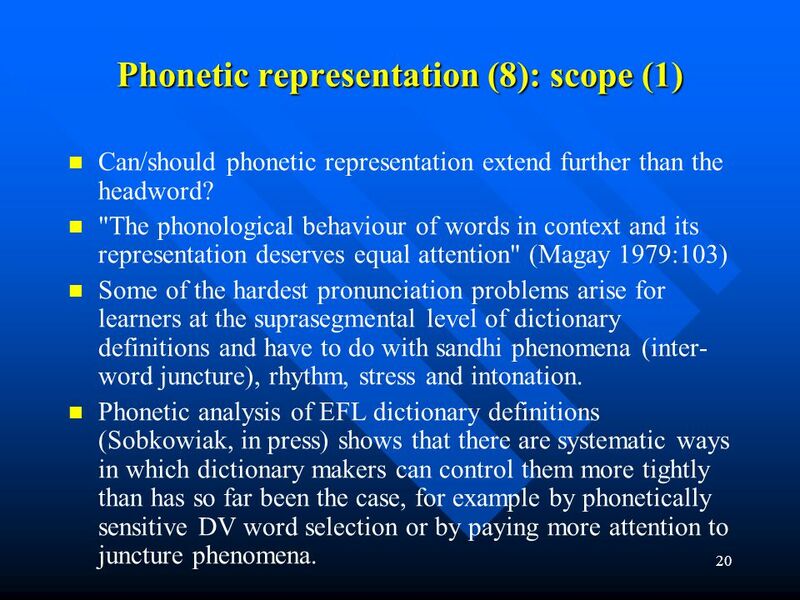 "The phonological behaviour of words in context and its representation deserves equal attention" (Magay 1979:103) Some of the hardest pronunciation problems arise for learners at the suprasegmental level of dictionary definitions and have to do with sandhi phenomena (inter-word juncture), rhythm, stress and intonation. Phonetic analysis of EFL dictionary definitions (Sobkowiak, in press) shows that there are systematic ways in which dictionary makers can control them more tightly than has so far been the case, for example by phonetically sensitive DV word selection or by paying more attention to juncture phenomena. The representational function of transcription differs from its indexical (query) function. In traditional dictionaries the latter did not exist. In electronic dictionaries both functions must be smoothly integrated. Advanced users (teachers and students) need the latter function more than beginners. 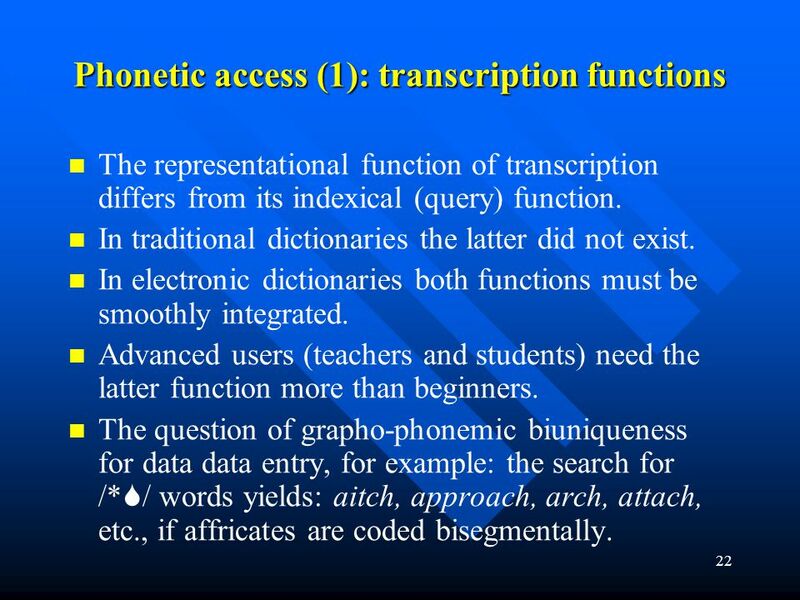 The question of grapho-phonemic biuniqueness for data data entry, for example: the search for /*/ words yields: aitch, approach, arch, attach, etc., if affricates are coded bisegmentally. 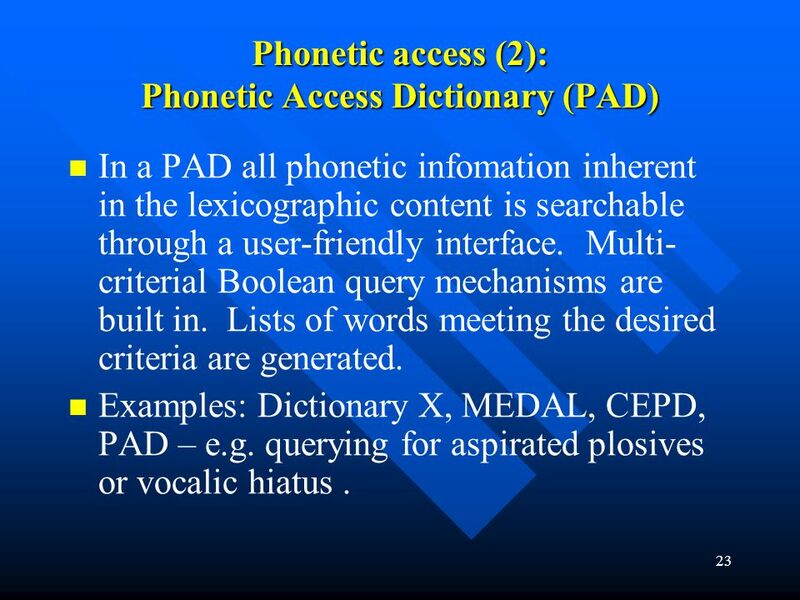 In a PAD all phonetic infomation inherent in the lexicographic content is searchable through a user-friendly interface. Multi-criterial Boolean query mechanisms are built in. Lists of words meeting the desired criteria are generated. Examples: Dictionary X, MEDAL, CEPD, PAD – e.g. querying for aspirated plosives or vocalic hiatus . 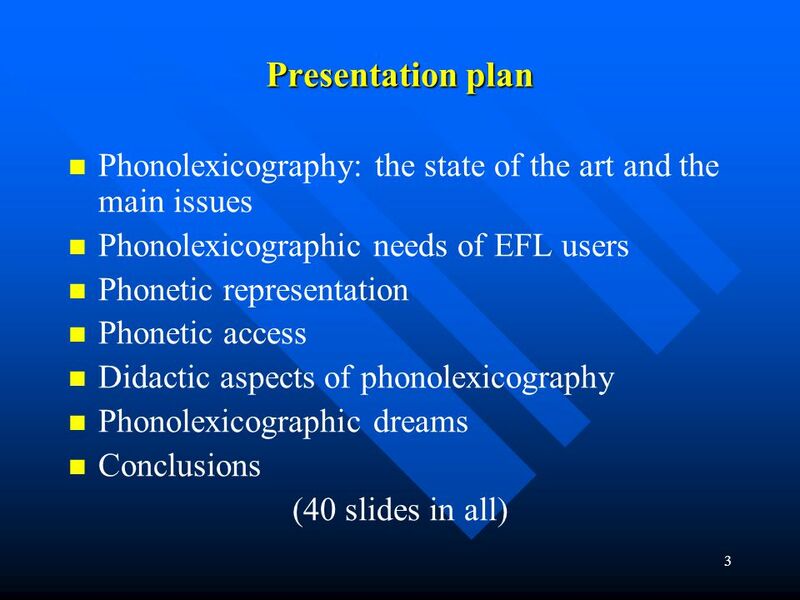 28 Didactic aspects of phonolexicography (1): e-dictionaries as teaching/learning resources? Brazil (1987:161): "It cannot realistically be seen as part of the dictionary's function to teach the sound system". 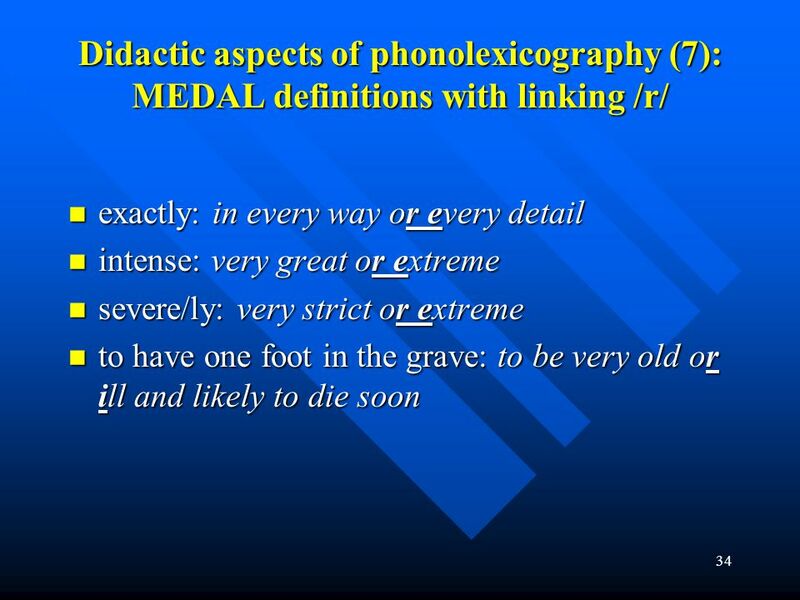 The traditional idiographic perspective of lexicography is not well suited to the needs of the foreign language learner, with his/her craving for some foothold of rules in the quicksand of idiosyncrasies. 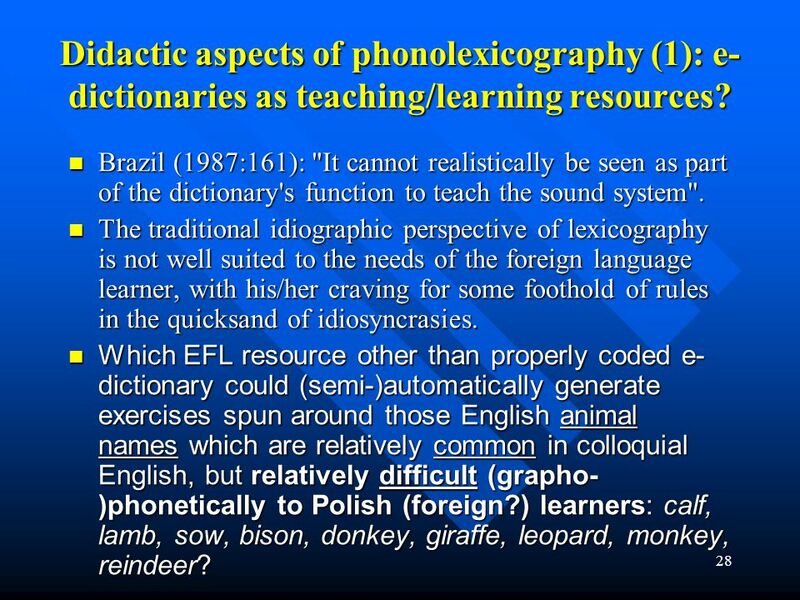 Which EFL resource other than properly coded e-dictionary could (semi-)automatically generate exercises spun around those English animal names which are relatively common in colloquial English, but relatively difficult (grapho-)phonetically to Polish (foreign?) learners: calf, lamb, sow, bison, donkey, giraffe, leopard, monkey, reindeer? Pronunciation practice could easily be combined with flashcards. Why is it that the only elements of an entry's microstructure used in flashcards are its headword and definition? 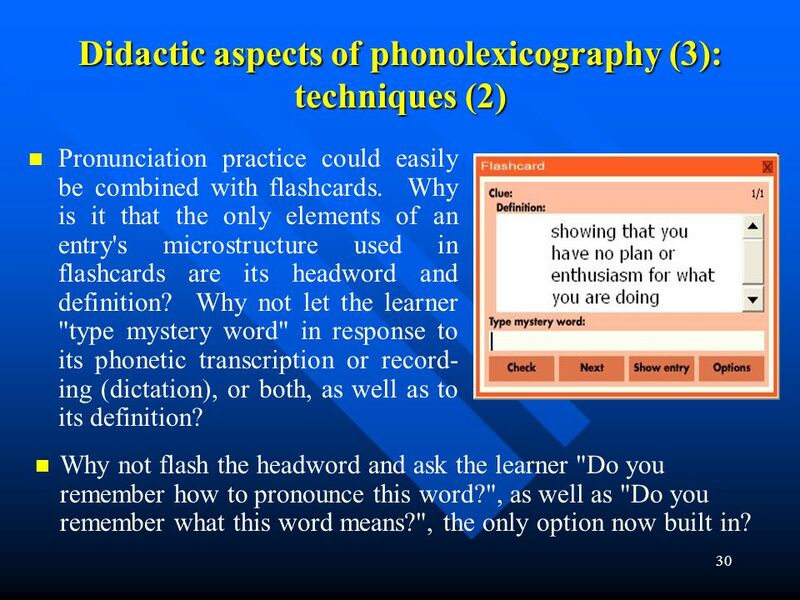 Why not let the learner "type mystery word" in response to its phonetic transcription or record-ing (dictation), or both, as well as to its definition? Why not flash the headword and ask the learner "Do you remember how to pronounce this word? ", as well as "Do you remember what this word means? ", the only option now built in? But one could, of course, go much further, e.g. into data-driven learning. For the beginner: "What do these words have in common, as far as pronunciation goes: dough, go, know, sew, toe?". For the advanced: aphrodisiac, Chianti, cordiality, piano, react?" (a selection from [*iæ*] headwords, containing a particularly troblesome case of vocalic hiatus). It is easy to transform these exercises into binary- or multiple-choice format, matching, selection or minimal pairs. 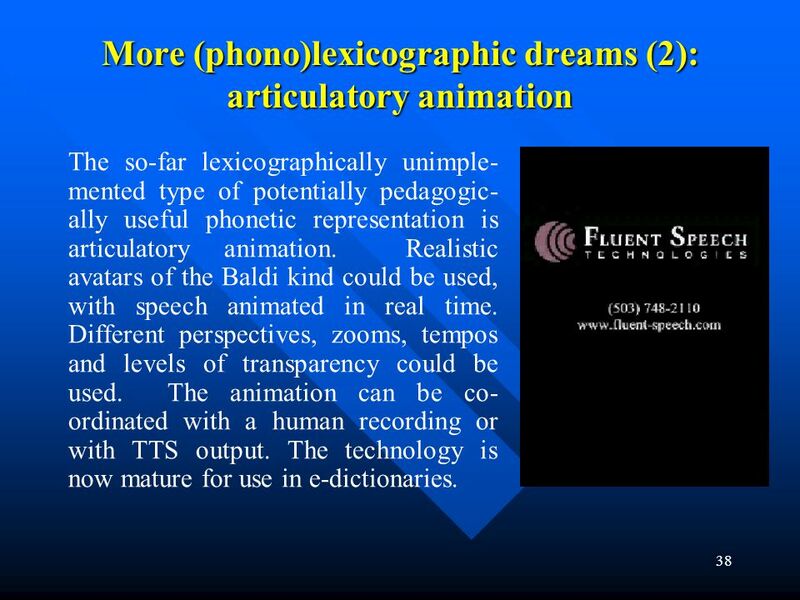 It is possible to combine them with audio and/or transcription, as well as part-of-speech information, lexical frequency tagging, dialectal and stylistic stratification, illustrations, etc. 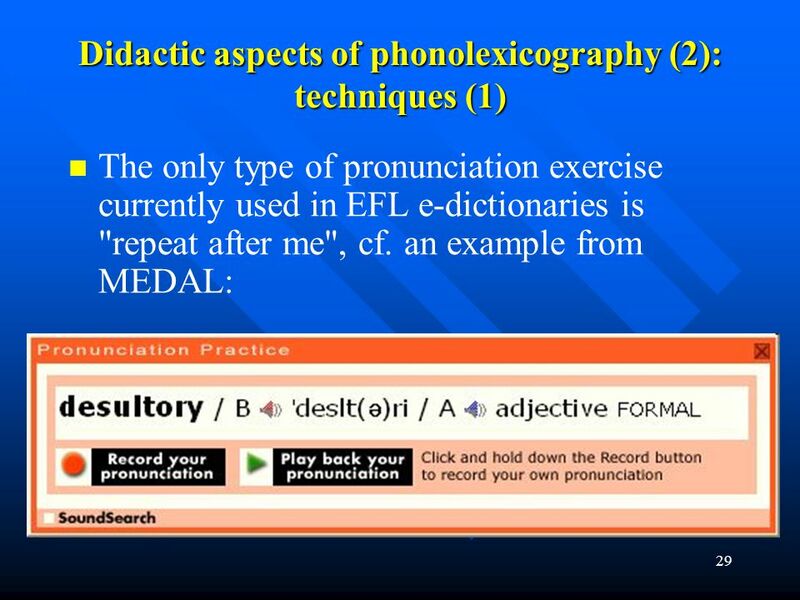 Both theoretical and applied phonolapsology must be L1-sensitive because phonetic interference from L1 is the amplest source of L2 pronunciation errors on most levels of proficiency. Contemporary EFL dictionaries are not L1-sensitive, or only superficially so (e.g. false-friends lists), mostly due to the overwhelming commercial factors (costs of localization). 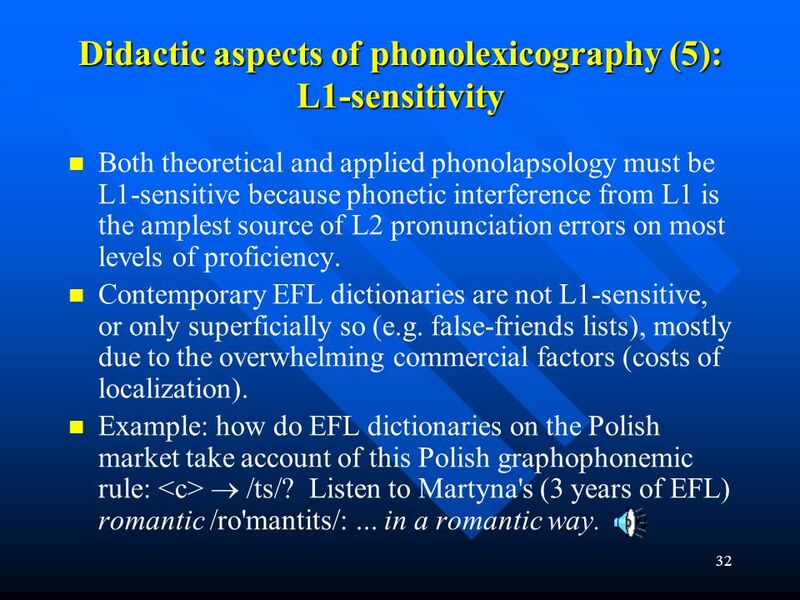 Example: how do EFL dictionaries on the Polish market take account of this Polish graphophonemic rule: <c>  /ts/? Listen to Martyna's (3 years of EFL) romantic /ro'mantits/: ... in a romantic way. 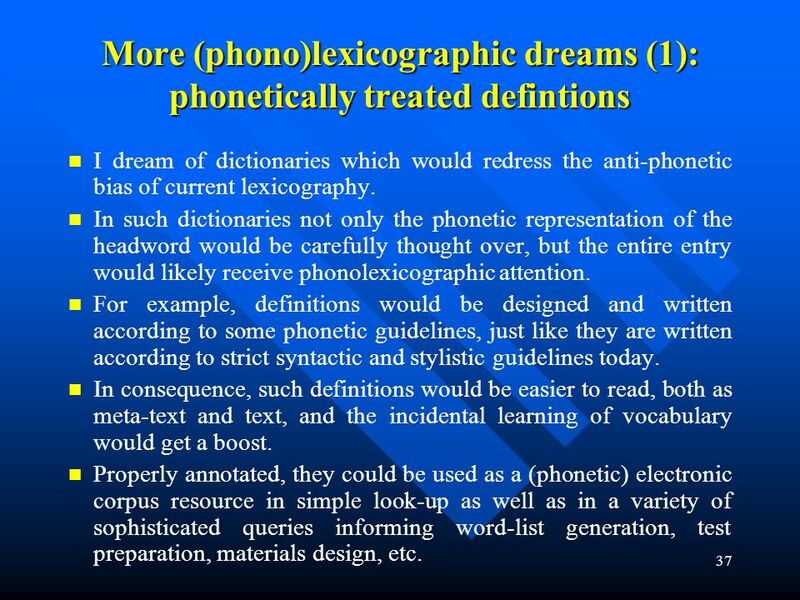 I dream of dictionaries which would redress the anti-phonetic bias of current lexicography. 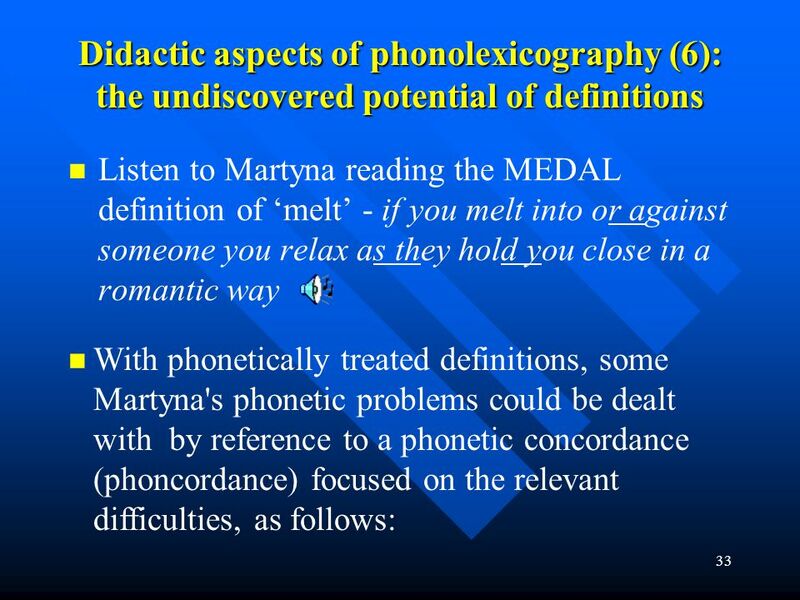 In such dictionaries not only the phonetic representation of the headword would be carefully thought over, but the entire entry would likely receive phonolexicographic attention. For example, definitions would be designed and written according to some phonetic guidelines, just like they are written according to strict syntactic and stylistic guidelines today. In consequence, such definitions would be easier to read, both as meta-text and text, and the incidental learning of vocabulary would get a boost. Properly annotated, they could be used as a (phonetic) electronic corpus resource in simple look-up as well as in a variety of sophisticated queries informing word-list generation, test preparation, materials design, etc. 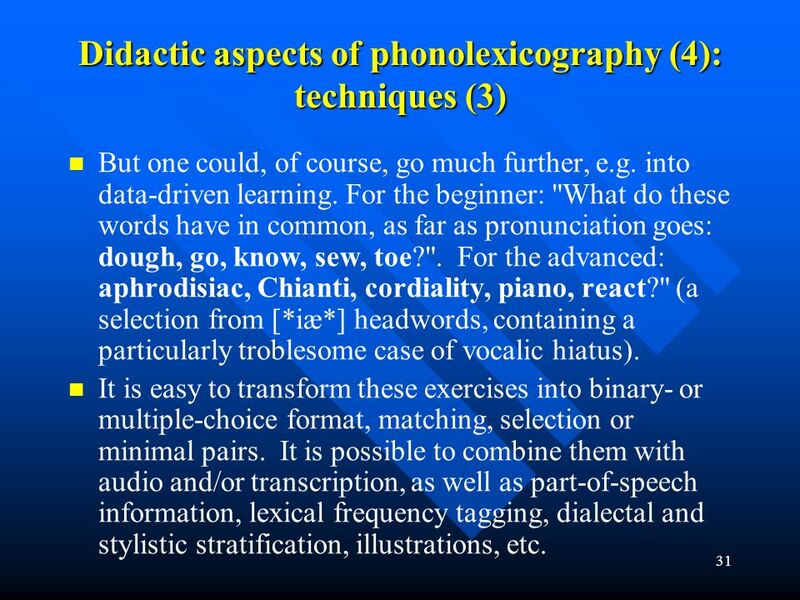 The so-far lexicographically unimple-mented type of potentially pedagogic-ally useful phonetic representation is articulatory animation. Realistic avatars of the Baldi kind could be used, with speech animated in real time. Different perspectives, zooms, tempos and levels of transparency could be used. The animation can be co-ordinated with a human recording or with TTS output. The technology is now mature for use in e-dictionaries. 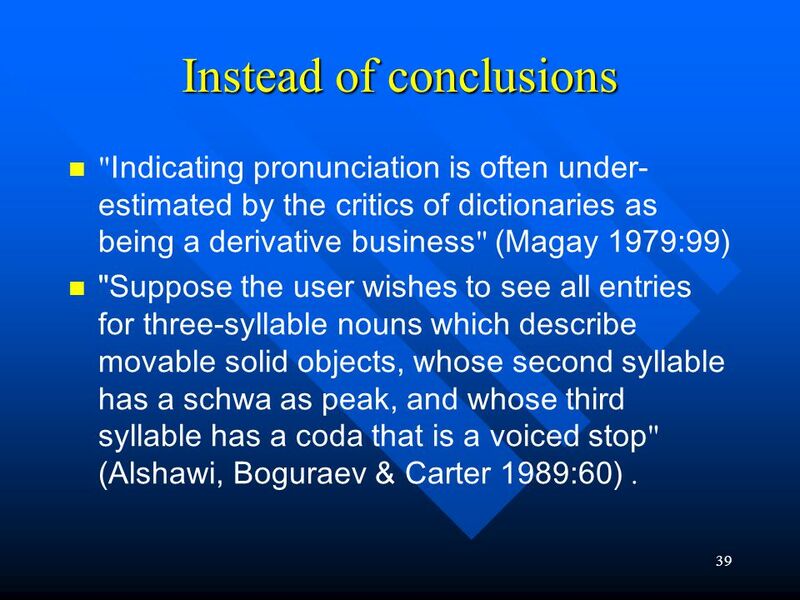 "Indicating pronunciation is often under-estimated by the critics of dictionaries as being a derivative business" (Magay 1979:99) "Suppose the user wishes to see all entries for three-syllable nouns which describe movable solid objects, whose second syllable has a schwa as peak, and whose third syllable has a coda that is a voiced stop" (Alshawi, Boguraev & Carter 1989:60) . 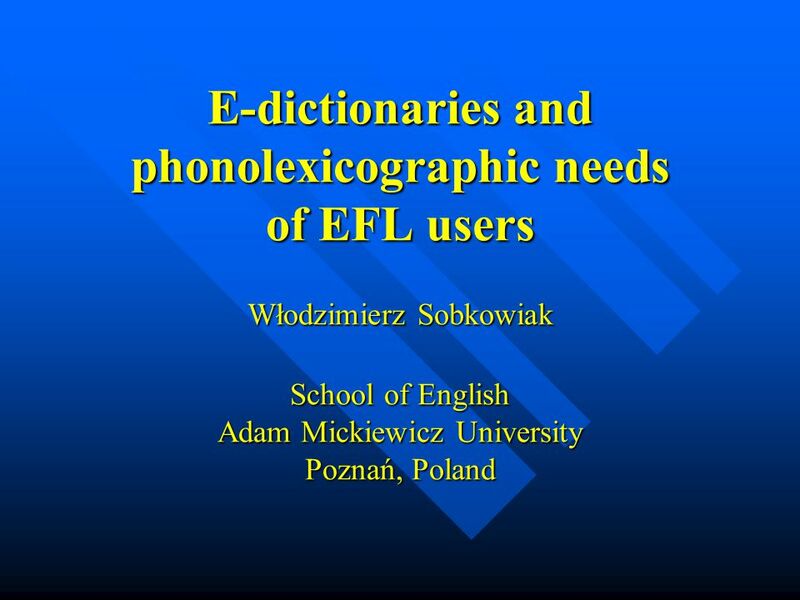 Download ppt "E-dictionaries and phonolexicographic needs of EFL users Włodzimierz Sobkowiak School of English Adam Mickiewicz University Poznań, Poland." wa.amu.edu.pl A DAM M ICKIEWICZ U NIVERSITY IN P OZNAŃ Faculty of English Some techniques of interactive phonolapsological scaffolding in graded e- readers. Wa.amu.edu.pl A DAM M ICKIEWICZ U NIVERSITY IN P OZNAŃ Faculty of English Phonolapsology of graded readers in EFL: PDI profile of a corpus of pedagogical. Interlanguage phonology: Phonological description of what constitute ‘foreign accents’ have been developed. Studies about the reception of such accents. 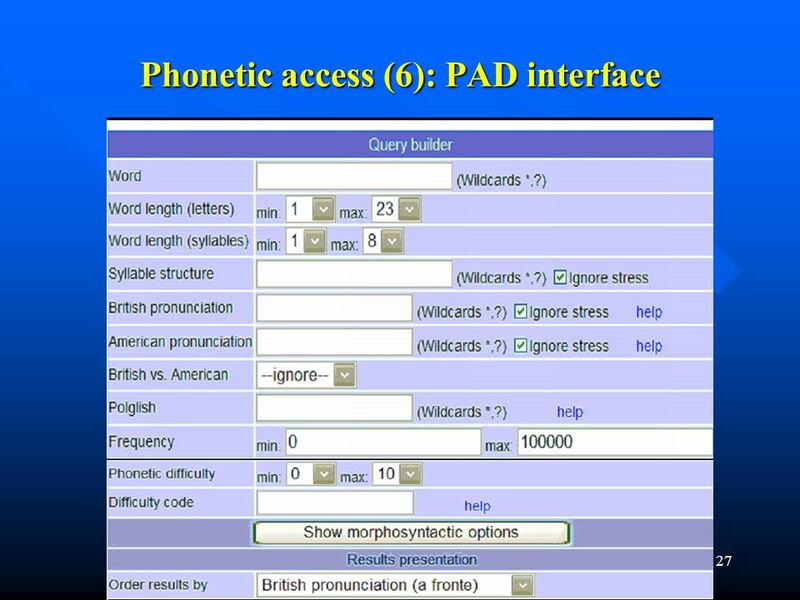 1 Włodzimierz Sobkowiak & Wiesława Ferlacka Calibrating the Phonetic Difficulty Index Twenty English words of four different phonetic difficulty levels. Adopting the Process Approach to Teaching Listening Dr. Jian Kang Loar Defense Language Institute October 15, 2011. CCAAL at PLM33, Bukowy Dworek, The challenge of electronic learners' dictionaries Włodzimierz Sobkowiak School of English, Adam Mickiewicz. Lesson 4 Grammar - Chapter 13.